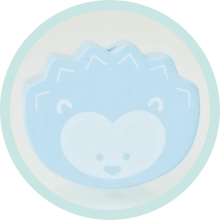 Igel pastellblau wach [704-26-56-002-00-00] - €1.00 - Babygeschenke24.de - Ihr Shop für hochwertiges Bastelmaterial uvm. Diese Motivperle ist zur Herstellung von Schnullerketten, Kinderwagenketten und anderem Babyspielzeug für Säuglinge und Kleinkinder geeignet und entspricht den Anforderungen der DIN-EN 71-3 und EN 71-9. Achtung! Einzelteil im unverbauten Zustand verschluckbar, erst im fertigen Spielzeug können die Einzelkomponenten der DIN EN 12586 entsprechen. Our wooden motif beads for making your own soother chains, bracelets and much more - all comply with the requierements of DIN-EN 71-3 and EN 71-9. The products are from German-made brand quality production. The beads are made of beech and maple wood. The colours used are non-toxic, sweat and saliva-proof and contaminant-free. All items used in the production of soother (pacifier) chains are unsuitable for children under the age of three years due to small parts that may present a choking hazard. This warning no longer applies when the soother (pacifier) chain has been assembled.